Game piracy isn’t just something that affects big studios, and it can have a huge impact on smaller teams; that’s why the coders behind Game Dev Tycoon decided to release their own cracked version, albeit with a moral lesson hardcoded for pirates. Fully expecting a cracked copy of the game to surface shortly after the $7.99 Game Dev Tycoon was released, Greenheart Games pipped the pirates to the post and added a torrent of their own. However, what downloaders didn’t realize was that the cracked version had a bug the authentic one didn’t: players would inevitably run into the effects of game theft. After that point, it’s pretty much game-over for the player’s studio, with their bank account shrinking and bankruptcy the only result. Unsurprisingly, the clueless pirates weren’t too keen on a game that seemingly had no outcome but failure, missing the irony of their own behaviors in the process. 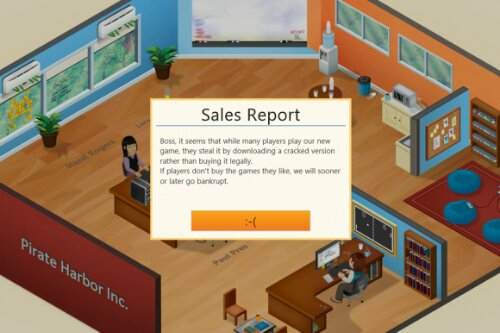 After a single day out in the wild, over 90-percent of those playing Game Dev Tycoon were using the cracked version, Greenheart Games discovered, thanks to some phone-home anonymous usage code built into both versions. Unfortunately, attempts to actually encourage those who might be tempted to pirate the game to instead pay for a legitimate copy have floundered, the developers say. Whereas Greenheart Games says it will still continue with non-DRM on its titles, that isn’t the approach some teams have decided to take. Notably, Microsoft is believed to be adding a mandatory internet connection requirement to its next-gen “Xbox 720” which would require titles be installed to the console’s hard-drive, and then connect to a server to be validated before play can take place. Greenheart’s site is currently up and down, probably due to interest in this little life-lesson, but you can find the Google cache here.